Advanced Polymer Clay Workshops - The Beadlady Craft Cafe and Art Studio - Imagine. Create. Inspire. The yummiest polymer clay workshop ever! Learn the secrets to my realistic yummy trinkets. 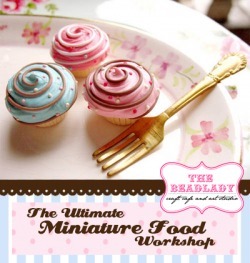 This advanced workshop will guide you through making scrumptious polymer clay cupcakes, ice cream, truffles, and cakes. Add realistic textures and color, and learn the techniques in making sprinkles and toppings for your miniature desserts. This class is only open for those who have taken our Beginners' classes.